Few figures in British political history have endured such lingering hostility as the statesman who did so much to forge Europe’s post-Napoleonic settlement, says John Bew. No British statesman of the 19th century reached the same level of international influence as Robert Stewart, Viscount Castlereagh (1769-1822), or, at least, none won as much respect from the great powers of Europe or in the United States. But very few have been so maligned by their own countrymen and so abused in history. This shy and handsome Ulsterman is perhaps the most hated domestic political figure in both modern British and Irish political history. He was denounced as a murderous tyrant who took the tactics he learned repressing rebellion in Ireland into his British political career, the pre-eminent bogeyman of a repressive Tory government. Radicals plotted to behead him, mobs stoned his house and even his funeral procession was hissed as his coffin made its way into Westminster Abbey to be interred between the two parliamentary titans of the age – William Pitt and Charles James Fox. In The Masque of Anarchy, Percy Bysshe Shelley depicted him as the very face of ‘murder’, the Irish-born Grim Reaper, reaching into his ‘blood-soaked cloak, tossing human hearts to the rabid bloodhounds which circled his feet’. Lord Byron, from the comfort of Italy, urged passers-by to ‘piss’ on his grave. ‘Was England to be allowed to perish to please the poets?’ asked a bemused French observer. Napoleon once asked ‘how a wise nation can allow itself to be governed by such a fool.’ But these were the bitter words of a defeated man, prompted by the fact that Castlereagh played a central role in the little emperor’s demise. The heroes of the Napoleonic Wars are usually Nelson, Wellington and William Pitt. Yet Castlereagh’s life – as chief secretary for Ireland from 1796 to 1800, colonial secretary from 1802 to 1805, war secretary from 1806 to 1809 and foreign secretary from 1812 to 1822 – was inextricably intertwined with each of these men. He remained at the heart of the war effort from the Battle of Trafalgar in 1805 through to the Battle of Waterloo in 1815. It was Castlereagh who transcribed the last thoughts of Pitt the Younger before his death in 1806 and put his war plan into action. It was outside Castlereagh’s office that Nelson and Wellington met for the one and only time just days before the battle of Trafalgar and Wellington would never have made it to Waterloo had it not been for Castlereagh’s perseverance and loyalty to his lifelong friend. 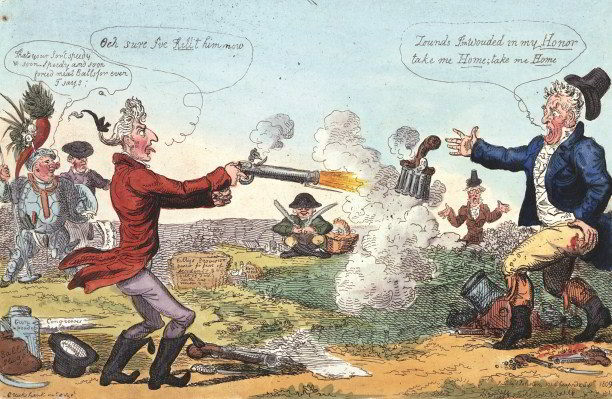 It was as a diplomat that Castlereagh was at his greatest – playing the central role in the creation of a European coalition to defeat Napoleon in 1814 (and again in 1815) and laying the basis for the system of congress-diplomacy between the Continental powers which, imperfect as it was, was a vast improvement on more than 20 years of war. Henry Kissinger, the former US secretary of state, too, celebrated Castlereagh as the exemplar of realpolitik and he has even returned to fashion in Britain. In recent times Lord Hurd, the former foreign secretary, and Sir Christopher Meyer, the former British ambassador to the United States, have both tried to revive his reputation as Britain re-adjusts itself to a changing 21st-century world. The current foreign secretary, William Hague, has suggested that Castlereagh’s work at the Congress of Vienna represents one of the most successful negotiations in the history of diplomacy. Such historical analogies have their merits but also their dangers. In the 1930s Neville Chamberlain was well versed in the foreign policy of both Castlereagh and his great rival George Canning – whom Castlereagh shot in the thigh with a pistol in a duel on Putney Heath in 1809 – and this did not prevent the disastrous collapse of his strategy towards Nazi Germany in 1938-39. John Bew is Lecturer in War Studies and Co-Director of the International Centre for the Study of Radicalisation and Political Violence at King’s College, London and the author of Castlereagh: From Enlightenment to Tyranny (Quercus, 2011).